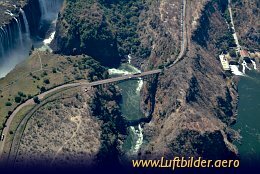 From the Victoria Falls Bridge, with the thundering falls in the back, adventureous bungee jumpers quaff off 111m towards the Zambesi River. 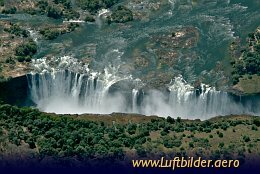 Mosia-oa-Tunya - the smoke that thunders - call the native inhabitants the Victoria Falls. 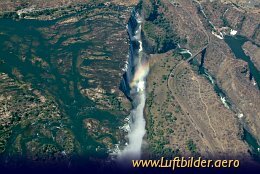 The dispersed waterfog can already be seen from the distance above the plans of the Zambesi River. The southern sun creates colourful and spectacular rainbows.